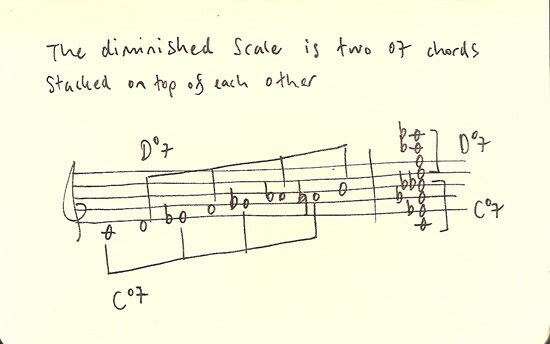 One way of looking at the diminished scale is to see it as two diminished chords arranged in various ways. If you stack them one on top of the other then you get a rather large chord. Impossible to play on the guitar but you could play it as a big arpeggio. Add a bit of reverb and delay and make the notes ring into each other. See if you can find some way of playing this (maybe in another key) that uses open strings, so you can sustain more notes as you play the arpeggio. Another way to see it is as two interwoven diminished chords. Another way is to play into each note of a C diminished 7th chord from a semi-tone below.